Bronx, NY According to Savanna and Hornig Capital Partners, owners of the Bruckner Building at 2417 Third Ave. in the Mott Haven neighborhood, catering company Great Performances has secured a 40,841 s/f, 20-year lease in the newly renovated property. Great Performances is moving to the Bruckner Building from their current location at 304 Hudson St. in Hudson Sq., and will occupy the first and third floors after moving into the space this summer. Manhattan, NY According to Newmark Knight Frank (NKF), co-working concept Knotel has leased the entire second floor at 36 West 14th St., owned by The New School. The company will occupy 36,500 s/f with a dedicated street entrance from West 14th St. between Fifth and Sixth Aves. Manhattan, NY According to Fisher Brothers, Wellspring Capital Management has signed a new 15-year, 14,698 s/f lease to occupy the entire penthouse floor at 605 Third Ave., its 1.1 million s/f office tower in Midtown. Lieberman of HSP Real Estate arranges 1,000 s/f lease to Usspeedtek Inc.
Manhattan, NY Evan Lieberman, senior director, HSP Real Estate Group, a member of NAI Global, has arranged a lease for Usspeedtek Inc., an international footwear wholesaler, at 214 West 39th St., between Seventh and Eighth Aves. The 1,000 s/f space represents the first New York office/showroom for the company, which services such fashion-forward sneaker brands as Lotto Leggenda and Seok. New York, NY Holliday Fenoglio Fowler, L.P. (HFF) has hired Mike Nieves as a director focused on M&A and corporate advisory services in the firm’s NY office. Manhattan, NY Cushman & Wakefield has arranged the $26.5 million sale of 212 Fifth Ave., a 4,620 s/f retail condominium. 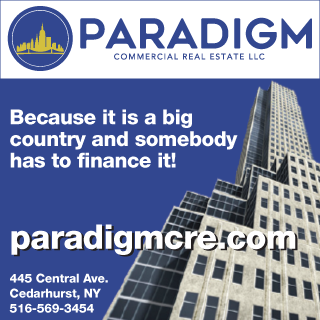 New York, NY The Real Estate Board of New York’s (REBNY) Real Estate Broker Confidence Index for fourth quarter of 2018 was 5.86 out of 10, an increase of 1.11 since brokers were surveyed about the third quarter of 2018. Bronx, NY Strong community support was voiced by neighborhood residents, small business owners and union members at a packed City Planning Commission hearing on rezoning to enable development of new affordable housing on Blondell Ave.
New York, NY Michael Eisenberg has helped companies increase profit margins, and sell out to larger ventures. He has launched Digital Guard Force (DGF), the culmination of a career spent navigating and closing the gap between humans and technology.